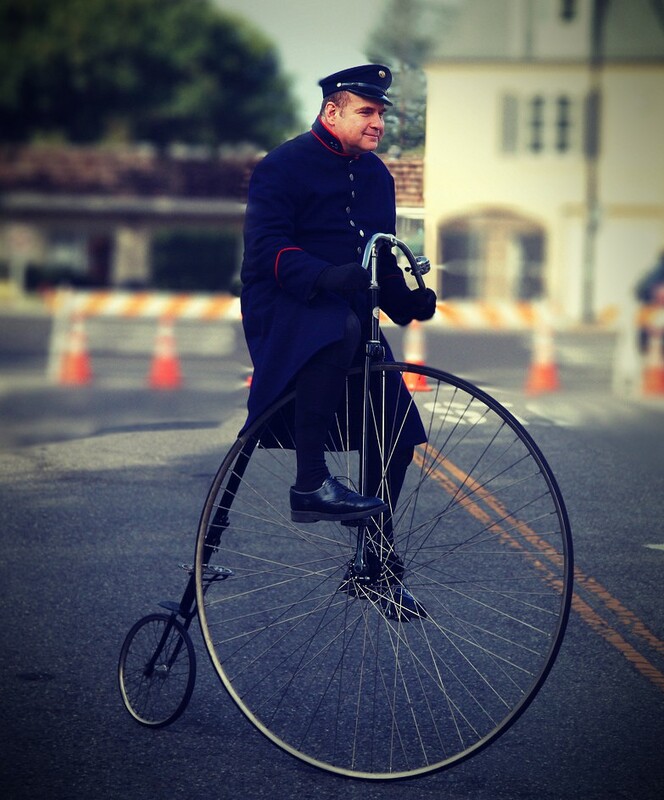 If I was to ask a Victorian what was unusual about the penny farthing bicycle, they'd probably look at me and wonder what the hell I was on about. Back in the day balancing precariously on top a giant wheel was nothing but a normal, everyday occurrence. However, with the power of hindsight, we're able to look back at them and see that they were in fact, a little bit odd. Before we begin, I hope you took the time to watch the great animation by V﻿﻿isual Artwork demonstrating the evolution of the bicycle. It's pretty cool! Although everyone now knows the name “penny-farthing” it’s unlikely that its name was used until it started to become a little out of date. The nickname comes from the British penny and farthing coins, the largest and smallest coins at the time. The front wheel commonly measured in at a large 2 meters in diameter. It had solid rubber tires, a cast iron frame, and pedals that attached directly to the wheel of the hub. What a beast. No messing about here. As the Penny Farthing used a big front wheel, it was able to go faster than other bikes of the time, and it had a smoother ride. The bicycle was designed by a British Victorian inventor name James Starley in 1878. A factory opened up in the United States, and the bikes became popular there first. Sadly the Penny Farthings bubble burst in the 1880s. Stanley's nephew came out of nowhere and invented the Rover Safety Bicycle. Probably the most noticeable feature of the safety bike was that it didn’t have a stupid massive front wheel. Around the same time a guy named John Dunlop invented the pneumatic tire. The pneumatic tire meant that smaller machines with smaller wheels were safer and more comfortable to ride. The cities Davis, California, and Redmond in Washington, actually have the Penny Farther as their symbol. The National Penny Farthing Championship races are held every year in Tasmania, Australia. To find out more about them click here! After doing a bit of research, I have come to the conclusion that it is impossible to look elegant while trying to get on to a Penny Farthing bicycle. However, the guy from Mec Videos manages to look half respectable. Watch from 1min in for the demo. Put your left foot on the step that is halfway up the bike frame. Push yourself forward until you start to get a bit of momentum. Once you’ve got some momentum step up towards the saddle. Sit down and find the pedals. When you’re on the seat, it’s as easy as peddling a regular bicycle. I fully expect it to be nowhere near as simple as that, but with a bit of practice, I'm sure you'll get the hang of it! What was unusual about the penny farthing bicycle? Well, I guess they look pretty odd, but they were the first machine ever to be named a bicycle, and for that reason alone you've got to love them!